An episcopal see is, in the usual meaning of the phrase, the area of a bishop's ecclesiastical jurisdiction. Phrases concerning actions occurring within or outside an episcopal see are indicative of the geographical significance of the term, making it synonymous with "diocese". The word "see" is derived from Latin sedes, which in its original or proper sense denotes the seat or chair that, in the case of a bishop, is the earliest symbol of the bishop's authority. This symbolic chair is also known as the bishop's cathedra, and is placed in the diocese principal church, which for that reason is called the bishop's cathedral, from Latin ecclesia cathedralis, meaning the church of the cathedra. 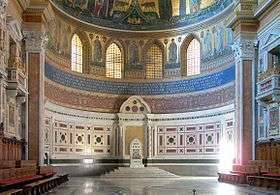 The word "throne" is also used, especially in the Eastern Orthodox Church, both for the seat and for the area of ecclesiastical jurisdiction. The term "see" is also used of the town where the cathedral or the bishop's residence is located. The episcopal see of the pope, the bishop of Rome, is known as "the Holy See" or "the Apostolic See", claiming Papal supremacy. The view of the Catholic Church contrasted by the Eastern Catholic idea of Pentarchy, followed by Eastern Orthodox opposition to papal supremacy. ↑ John Hardon, Modern Catholic Dictionary, s.v. "Episcopal see"
↑ Yale Law School, The Avalon Project: "Ordinance of William I Separating the Spiritual and Temporal Courts"
1 2 The Oxford Dictionary of the Christian Church (Oxford University Press 2005, ISBN 978-0-19-280290-3), s.v. "see"
↑ Merriam-Webster Dictionary: "holy see"
"See". Encyclopædia Britannica (11th ed.). 1911.